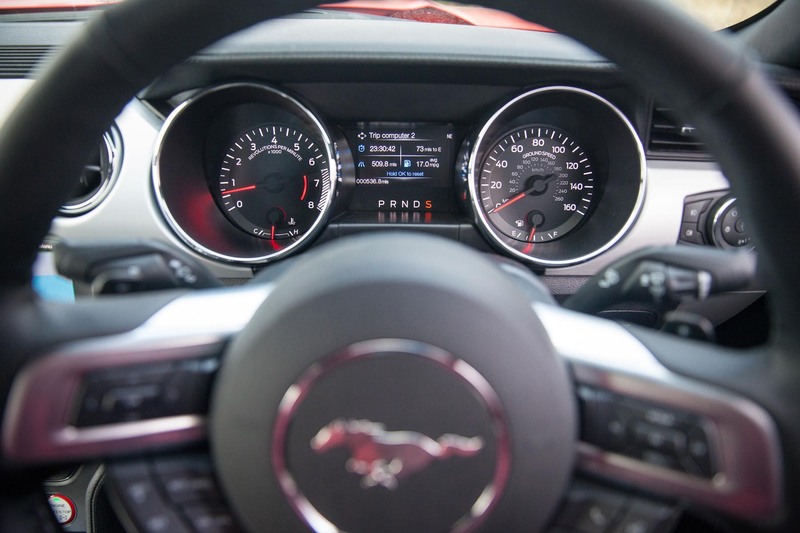 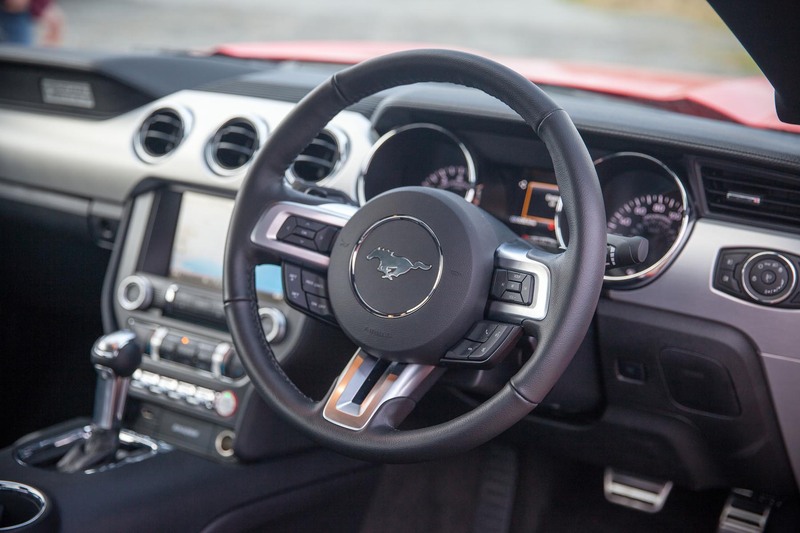 Since the early days the Mustang has seen a few generations pass by, to cope with the demand of each automotive era, with the third and fourth generation models being very boring, sedate and far removed from what their ancestry set out to do. 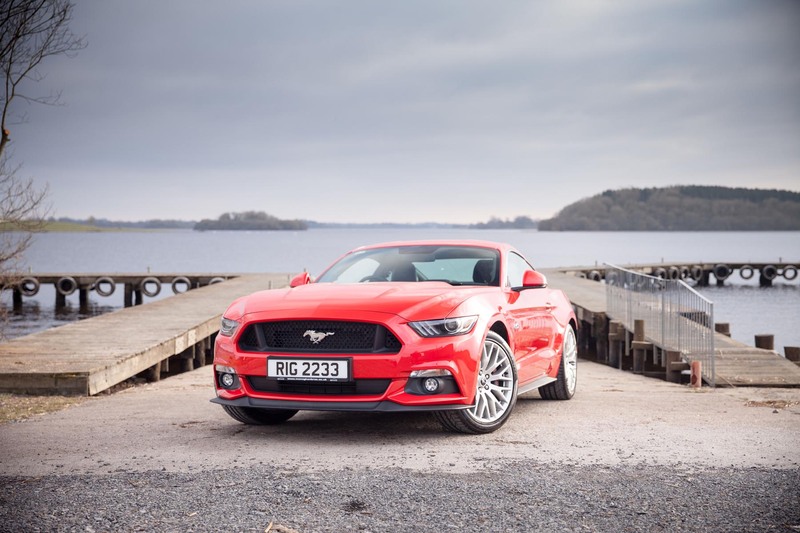 It wasn’t until 2005 that the Mustang became attractive again and started to take hints of its styling and character from its older brothers, however it was still only being produced in left hand drive and thus not available for the UK market. 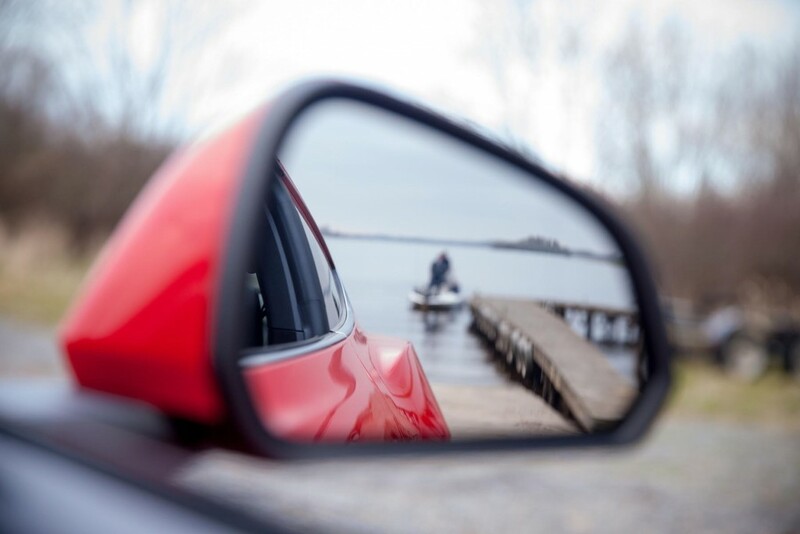 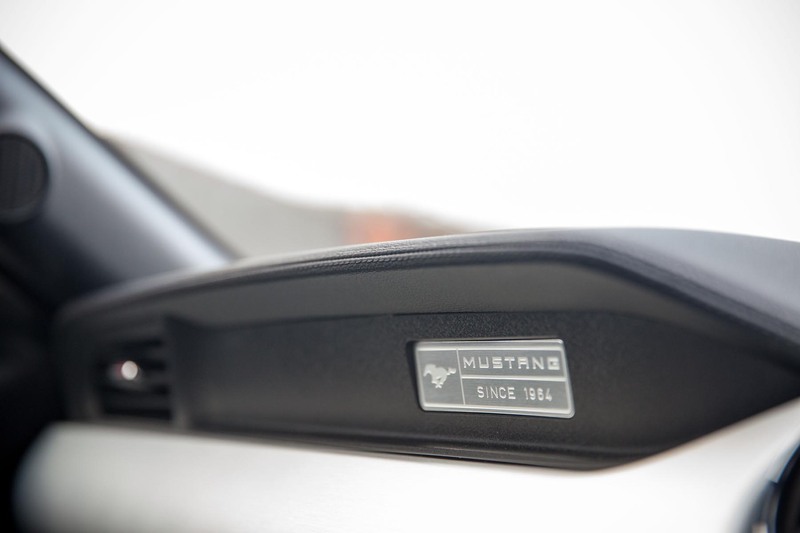 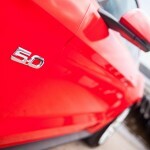 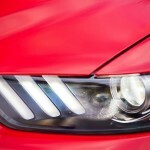 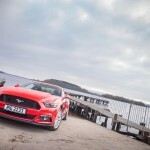 Fast forward ten years and we have an all new Mustang and the official launch of the first factory built, right hand drive cars was well underway with the first models due in UK and Ireland dealerships around the start of 2016 with hundreds of pre-orders snapping up the first boat loads of cars that arrived. I would say there are many Southern American’s turning in their graves at the thought of the Mustang being built in right hand drive, however Ford have responded to demand and opened the car up to several new markets due to this brave decision. 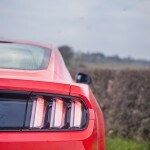 It wasn’t just this decision that was brave and likely hard to agree on, but also the fact that Ford have added an engine that makes every car nut shudder when it is mentioned. 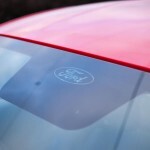 I will touch on this later when I find a polite way to put it, but it’s not in a V formation. 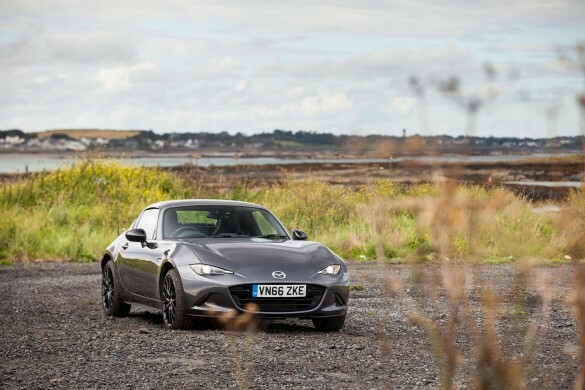 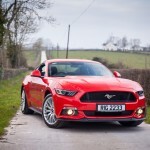 After a wild goose chase to find a Mustang for review from the Northern Ireland dealer network and with the help of fellow professional Chris B, it was the long standing family run Monaghan Brothers in Lisnaskea that came up trumps so on a sunny Friday afternoon I set off on the two hour trip, roof down on the Mazda MX-5 I was driving, with an air of excitement in the car. 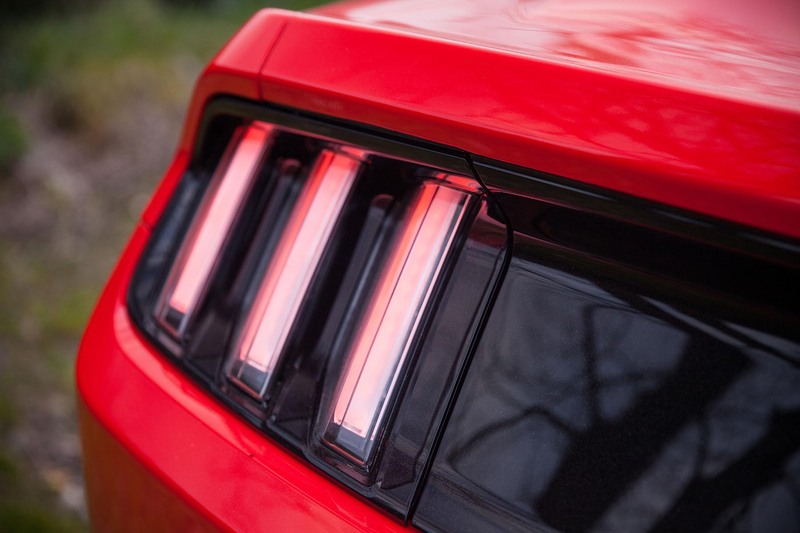 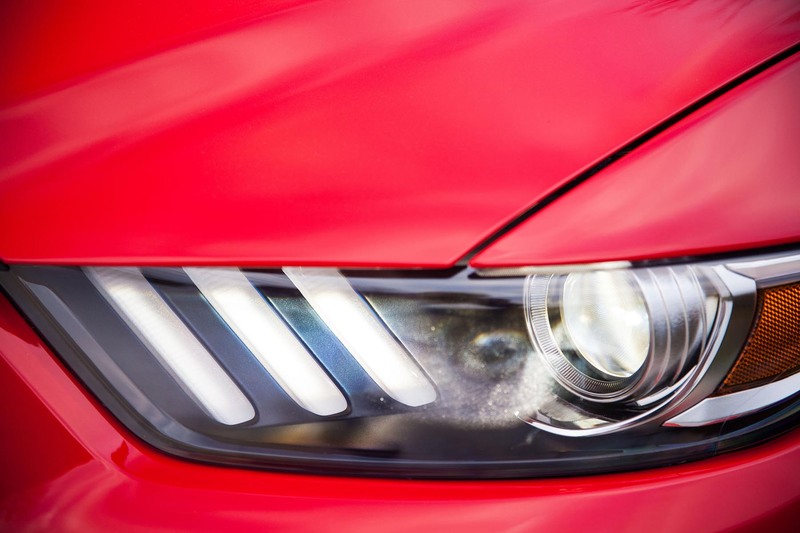 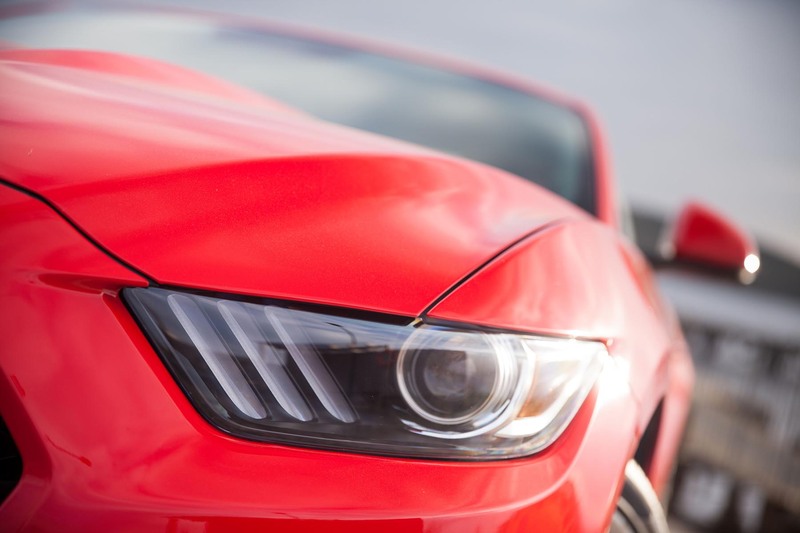 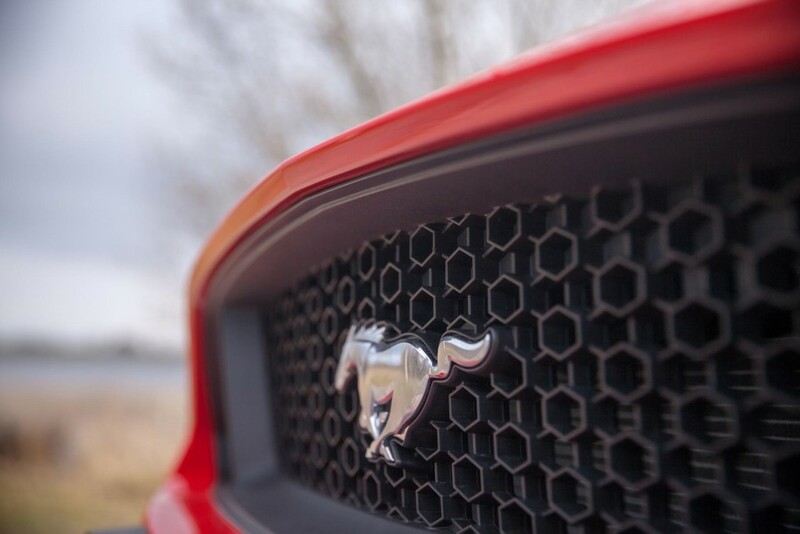 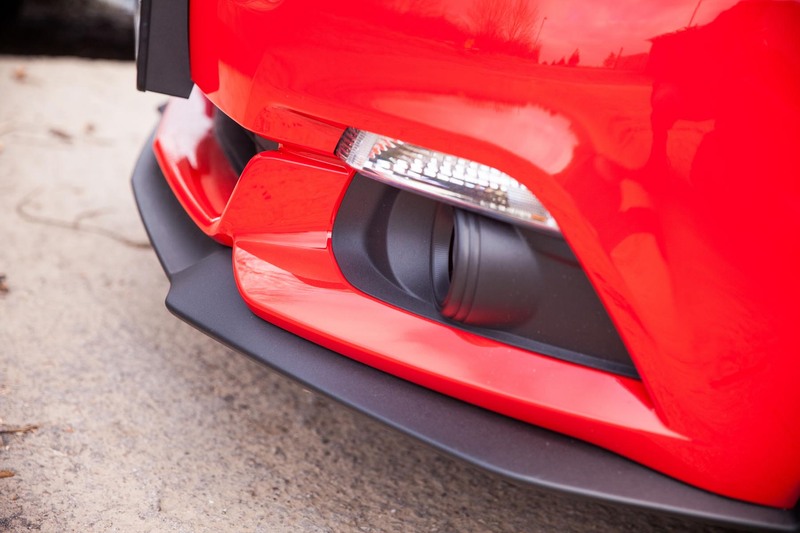 The front end of the Mustang is very squared off with the most prying of headlights, like hawks eyes drawing you into sheer hypnosis with its beauty. 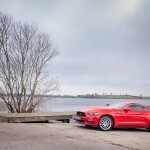 Only two body styles are available, convertible which is self explanatory and the coupé, known by Ford as the Fastback. 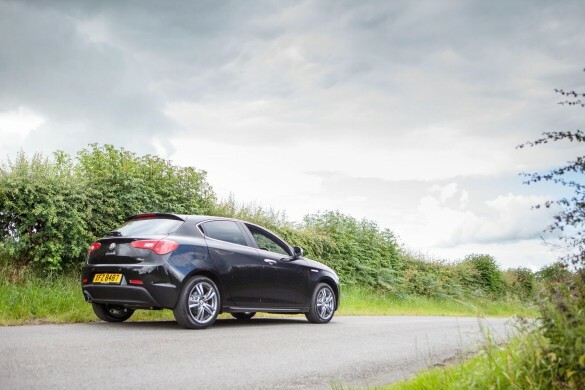 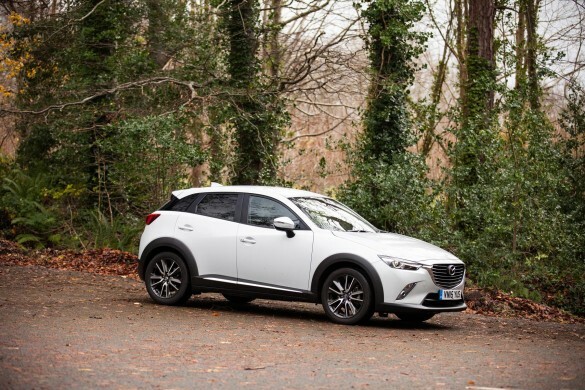 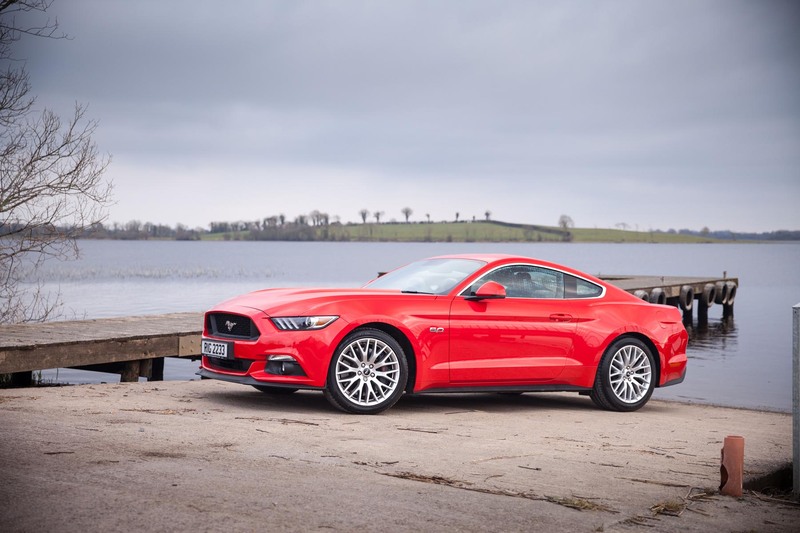 This model tested is the Fastback version giving it a solid tin top and a very sleek roof-line indeed and on opening the boot can confirm that the load space is very ample for being a coupé. 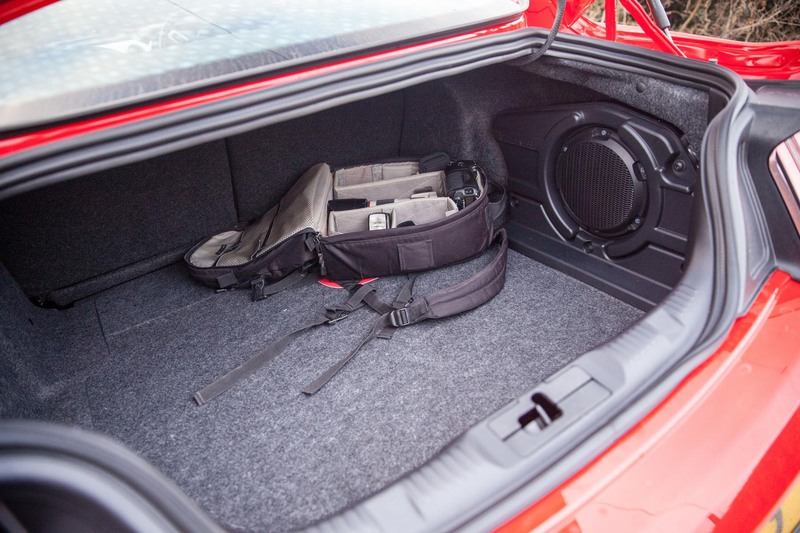 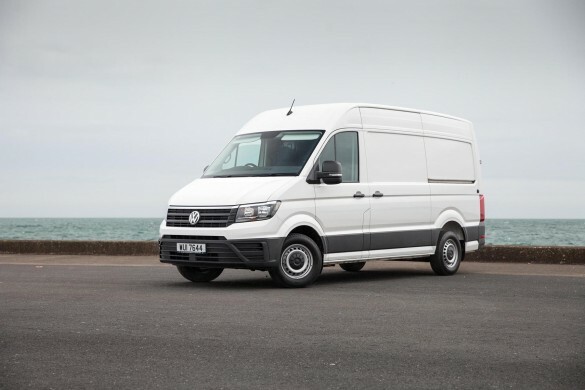 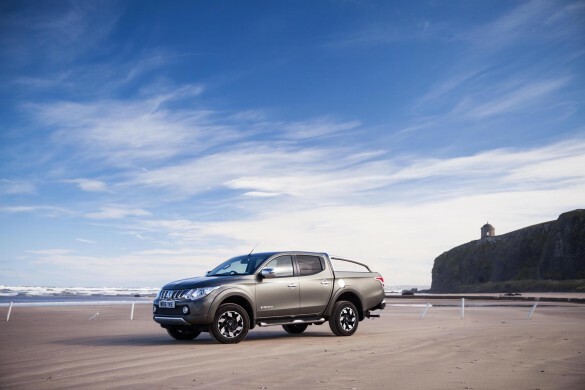 It offers a reasonable access area with room inside for a couple of weekend bags or a suitcase. 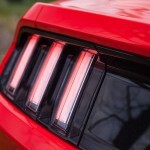 I am pretty sure a small buggy and weeks shopping would not be an issue at all and for those who intend to enjoy their Mustang fully, it is going to be a squeeze between the back seats and the boot to get spare wheels, fuel cans and helmets on board, however I know for sure I could make it all fit. 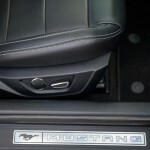 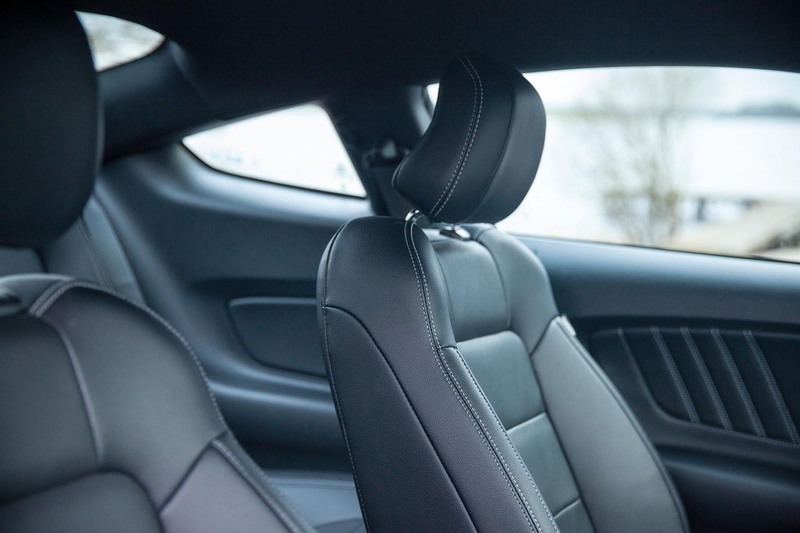 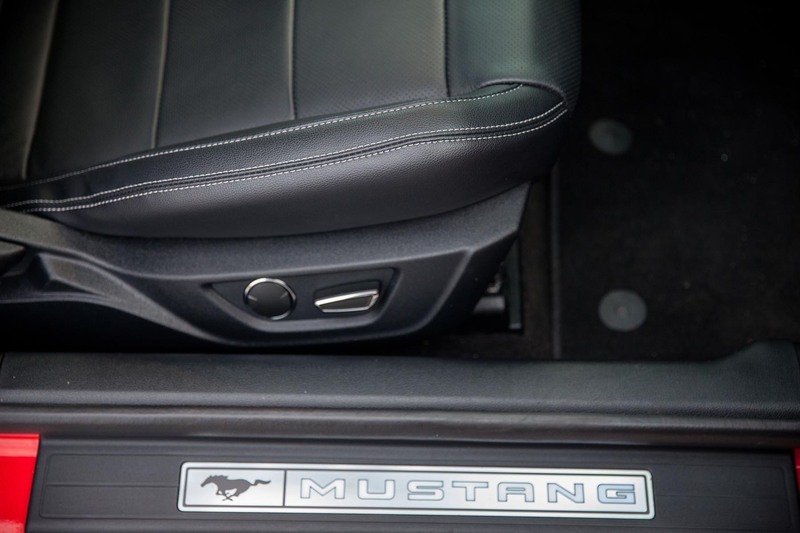 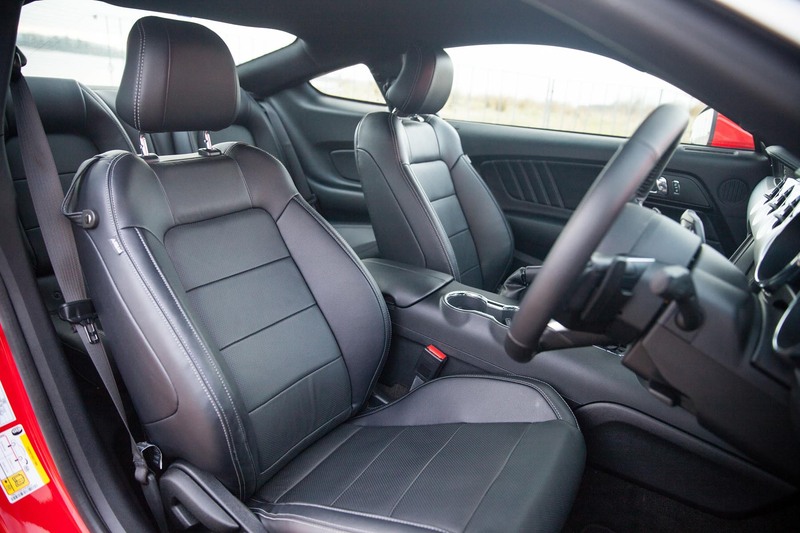 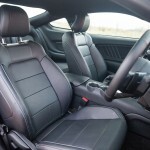 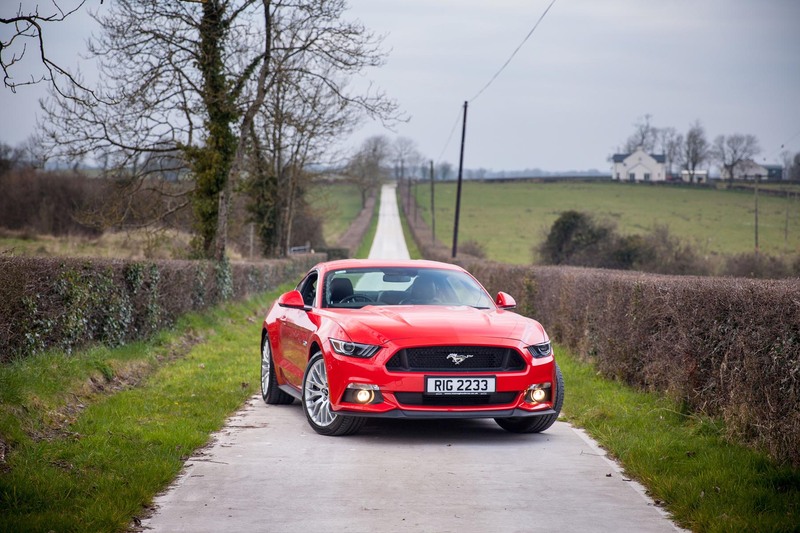 Being a coupé, the Mustang offers only four seats, though in the real world, anything but a short journey for teenager or smaller would be a little cramped in the rear both leg and head wise. 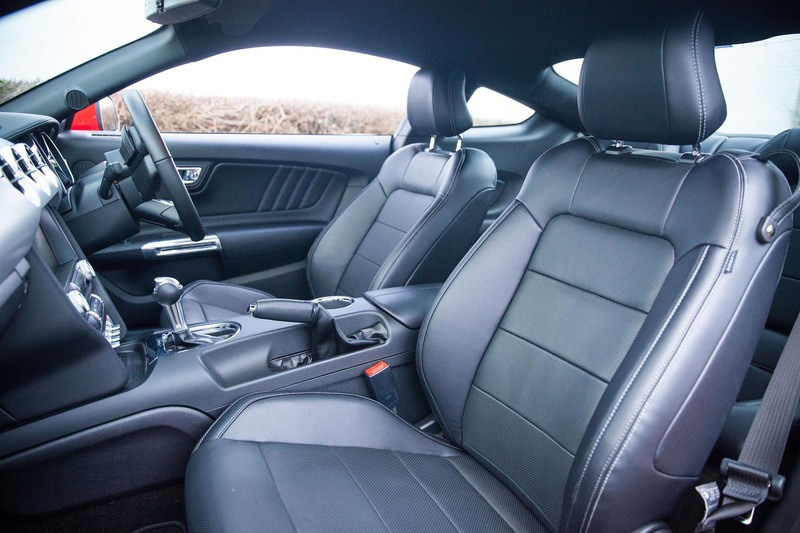 The black leather was incredibly soft and looks great with the white stitching while the front seats on this test car were heated with a cooling option also. 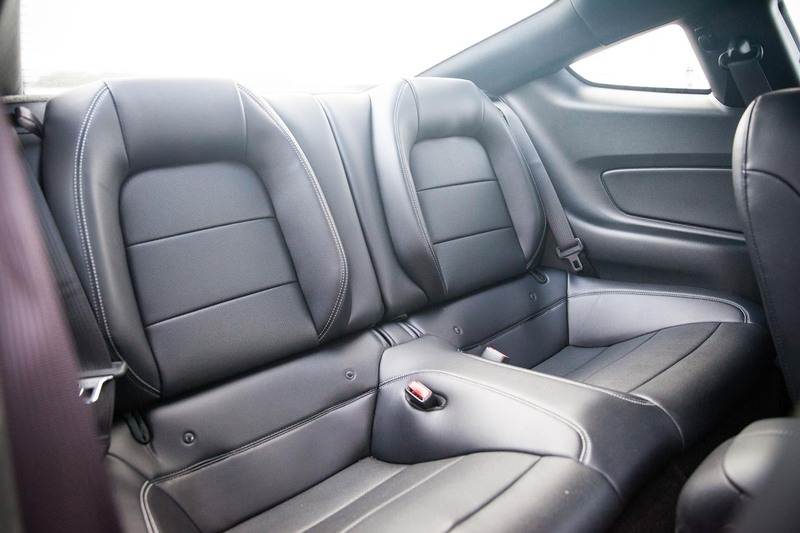 The seating position I found to be fantastic and the seats themselves incredibly comfortable, soft enough for a very long journey but with as much support as a female tennis players brassiere. 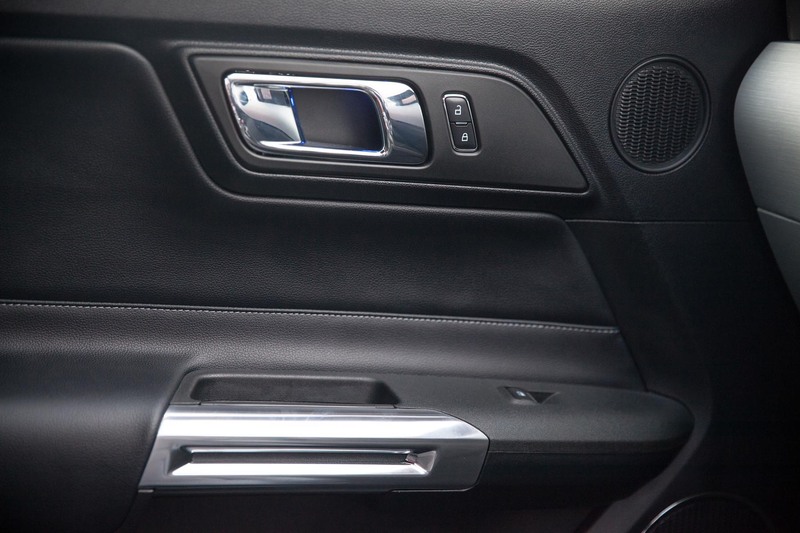 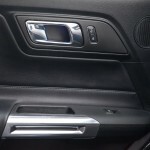 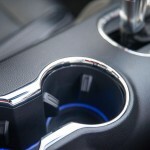 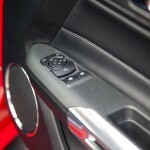 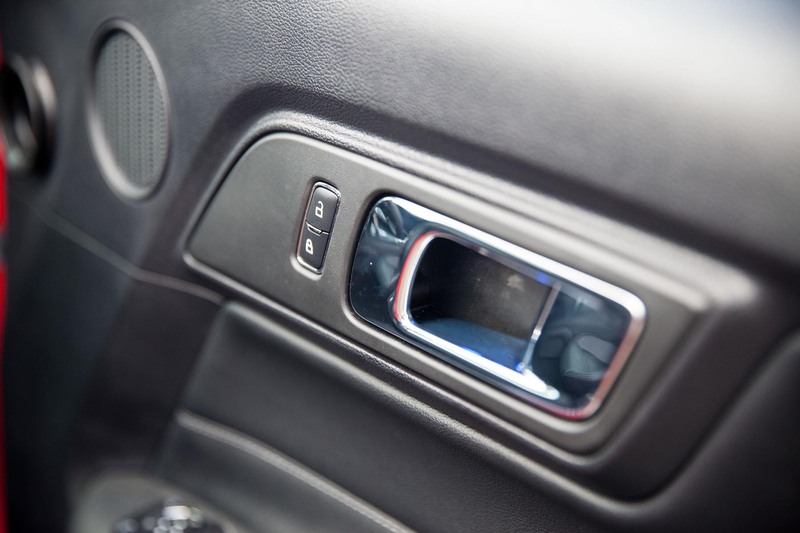 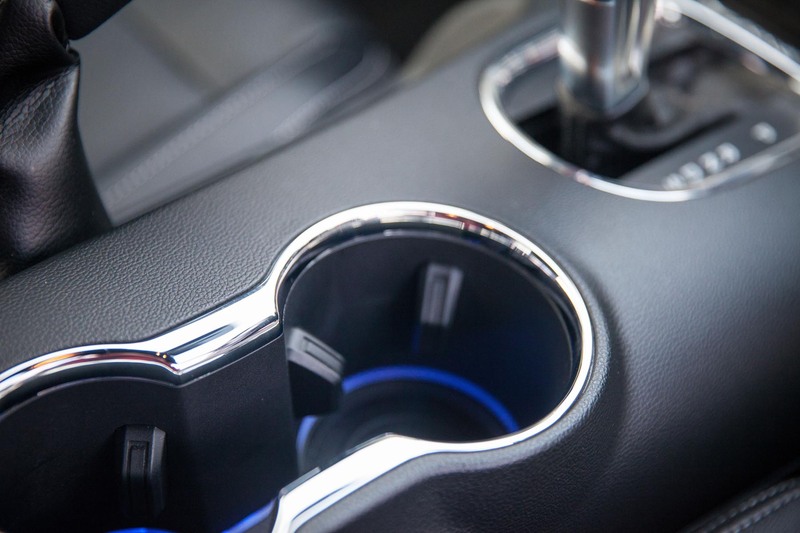 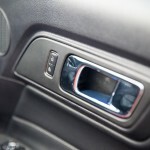 Inner door handles and cup holders were all highlighted via blue lighting which reflected in harmony against the chrome. 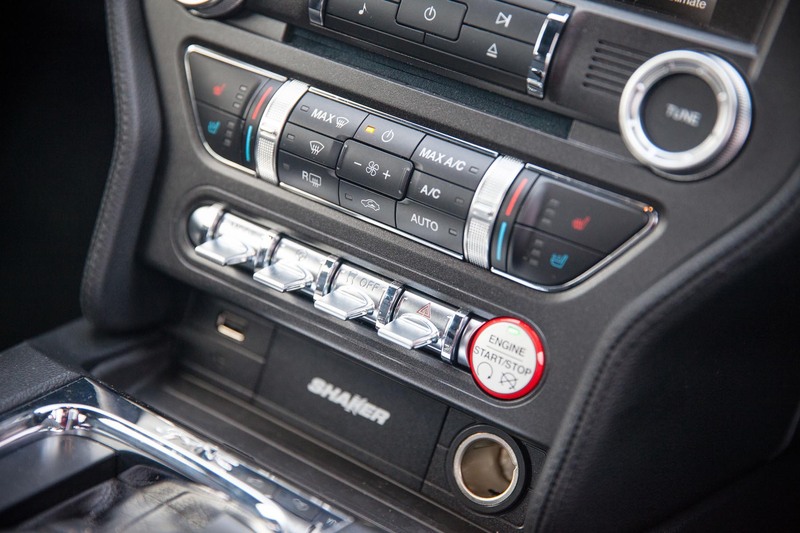 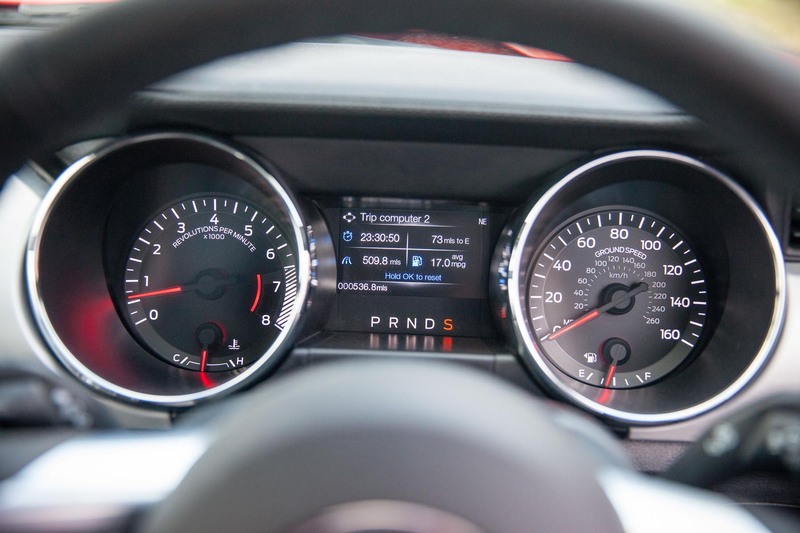 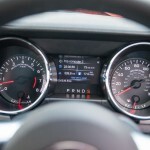 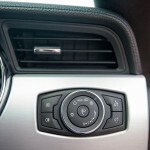 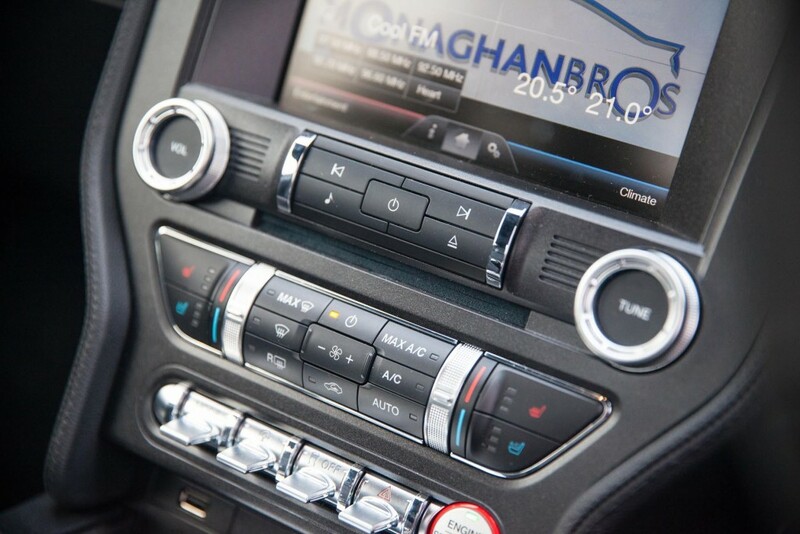 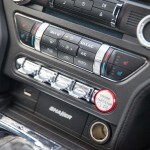 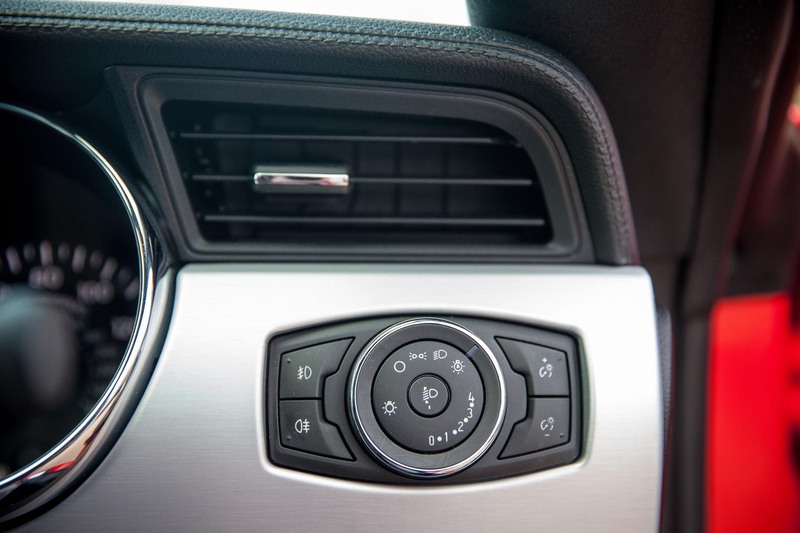 There are a lot of buttons on the dash, however being chunky they are easily distinguishable and also some important switch-gear that will turn off driving aids, and when it all goes wrong turn on the hazards are on large metal flick switches with the large starting button to the right of them. 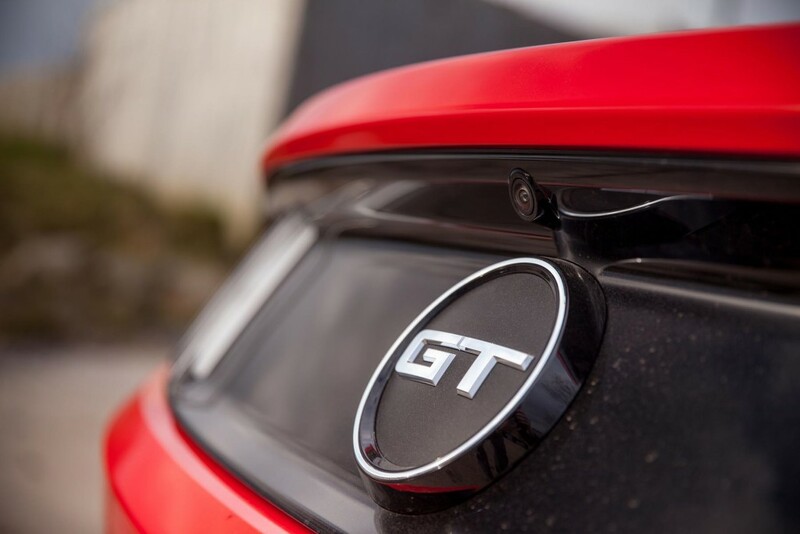 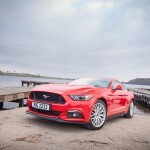 This brings me perfectly to the engine now and via my comment at the start, you will have already guessed that this test car is in fact the GT model with the 5.0L V8 petrol engine, the ONLY engine for the purist drivers and one that roots back to the good old Mustang of yesteryear. 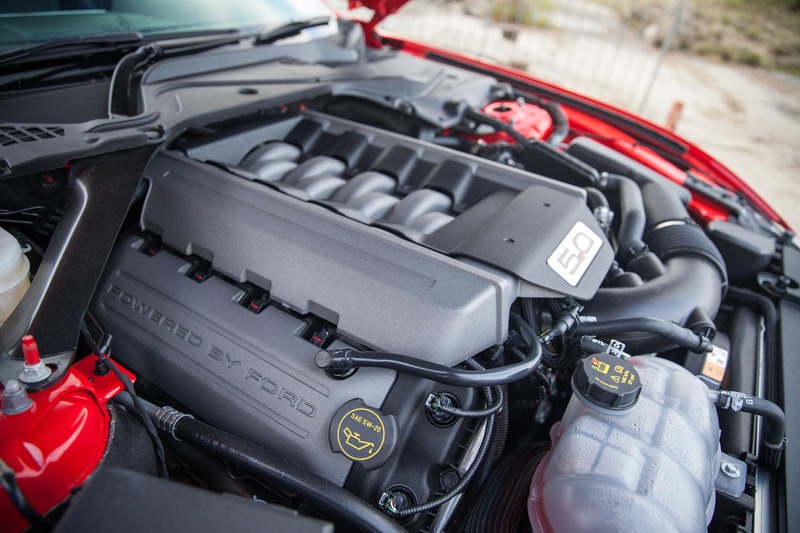 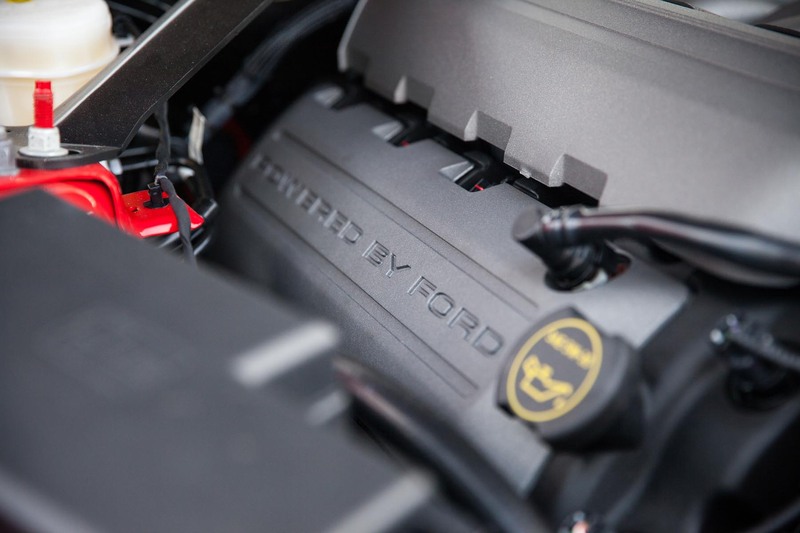 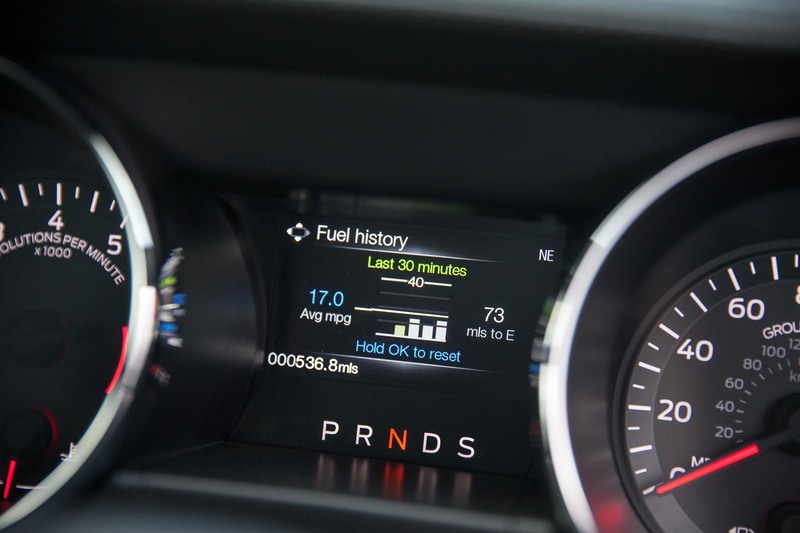 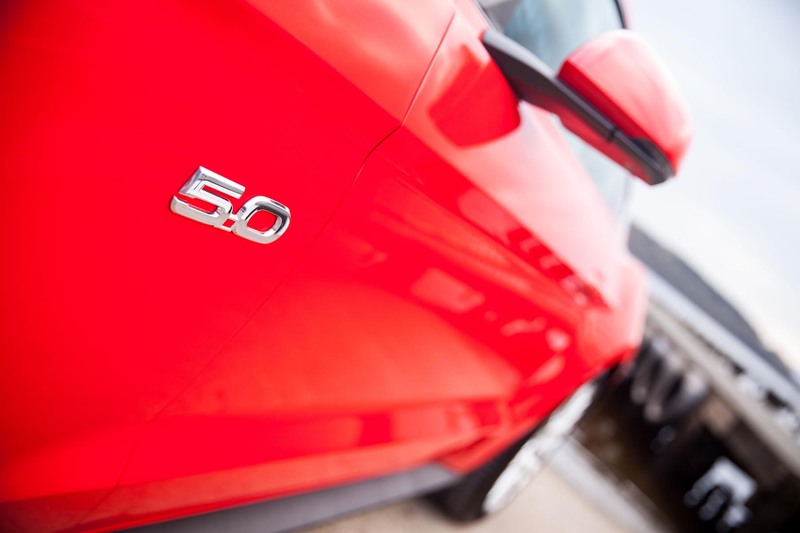 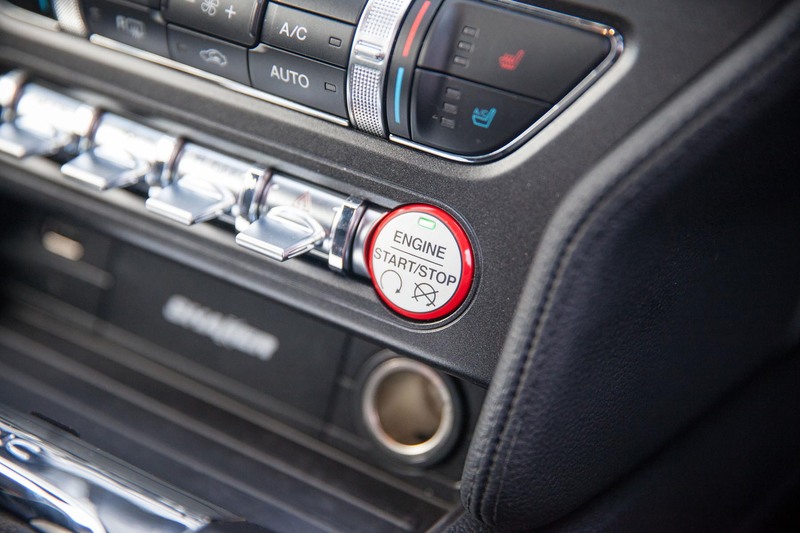 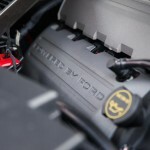 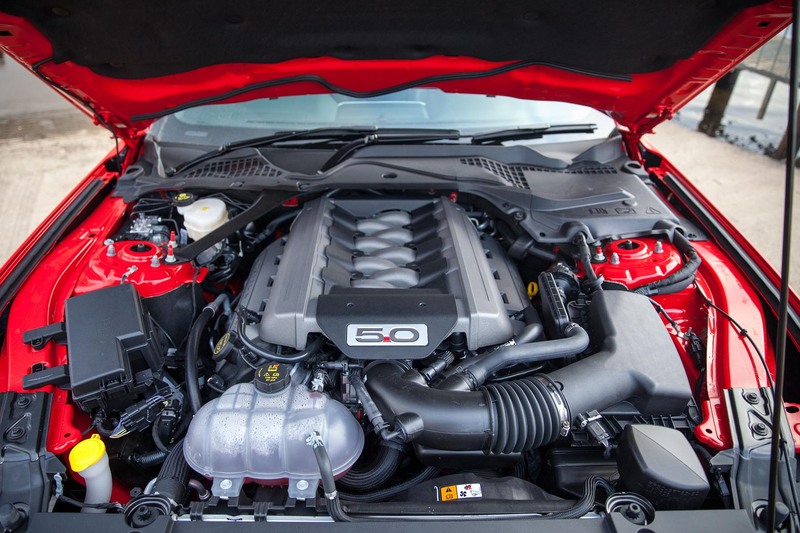 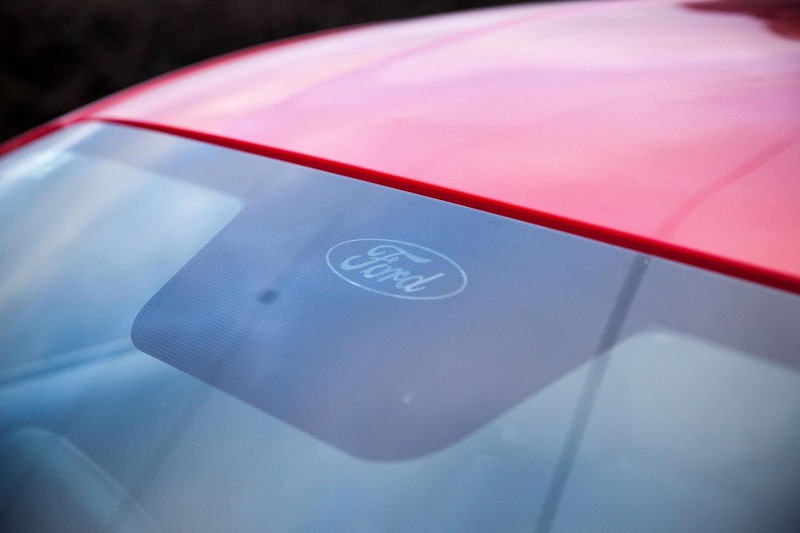 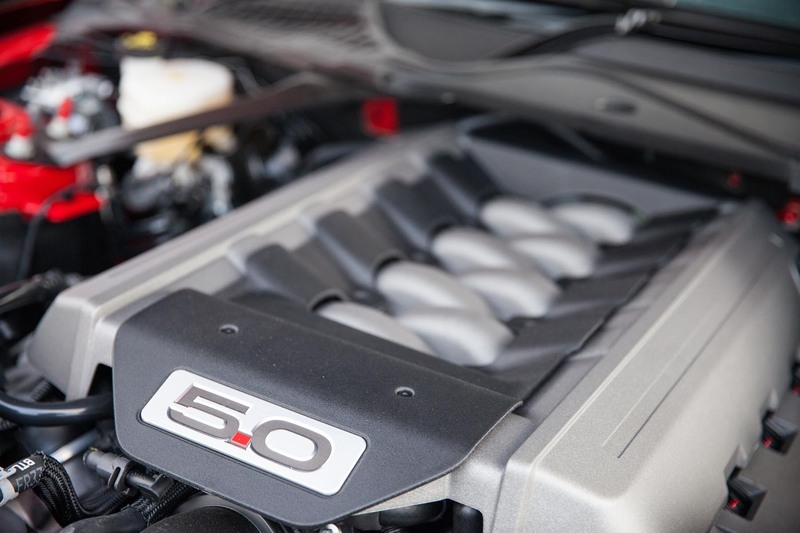 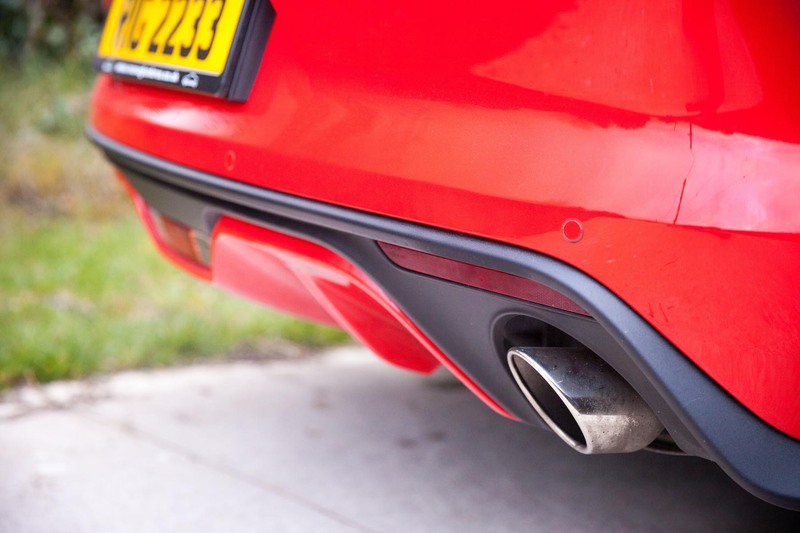 This engine was introduced to help sell the car in markets where emissions are tight and it also allows Ford to have very competitive pricing on the entry level 2.3L models. 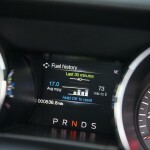 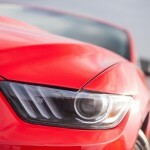 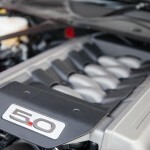 The V8 in the Mustang is a 5.0L “Coyote” unit producing a potent 415bhp and will propel you to 60mph in just 4.8 seconds. 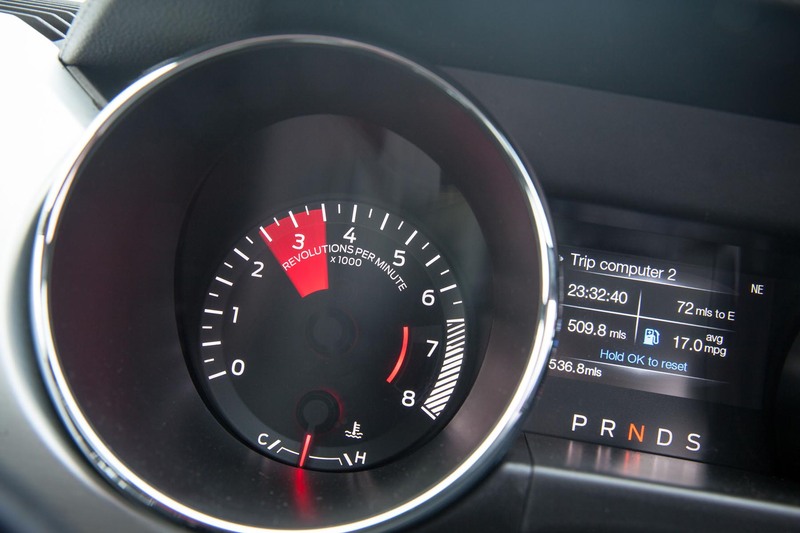 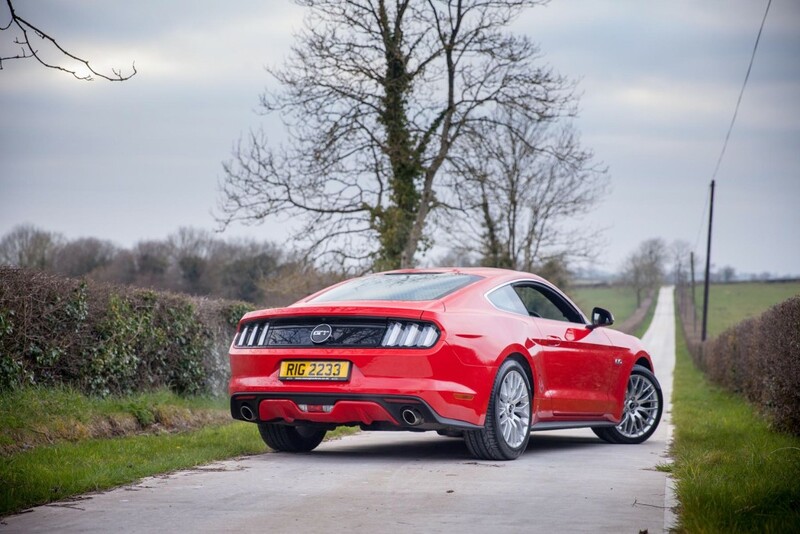 This I can assure you will be the best 4.8 seconds you will ever have with your clothes on as once the loud pedal is pressed; the Mustang sinks the rear end and squirms its way up the road between gears in a manner that demands respect. 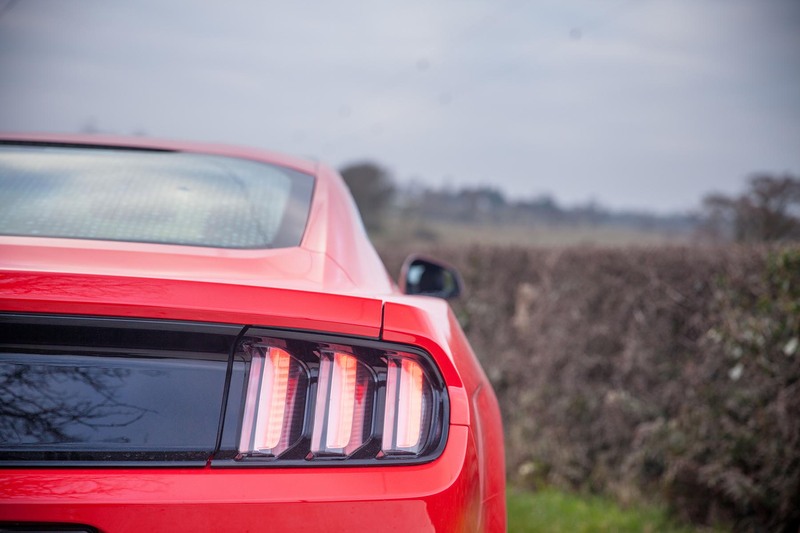 Not only does it look great, feel great and pull like a steam train, but it also sounds phenomenal, nothing like other V8 cars within the class, not at all. 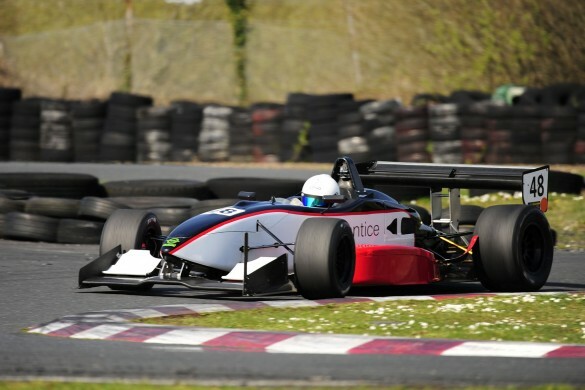 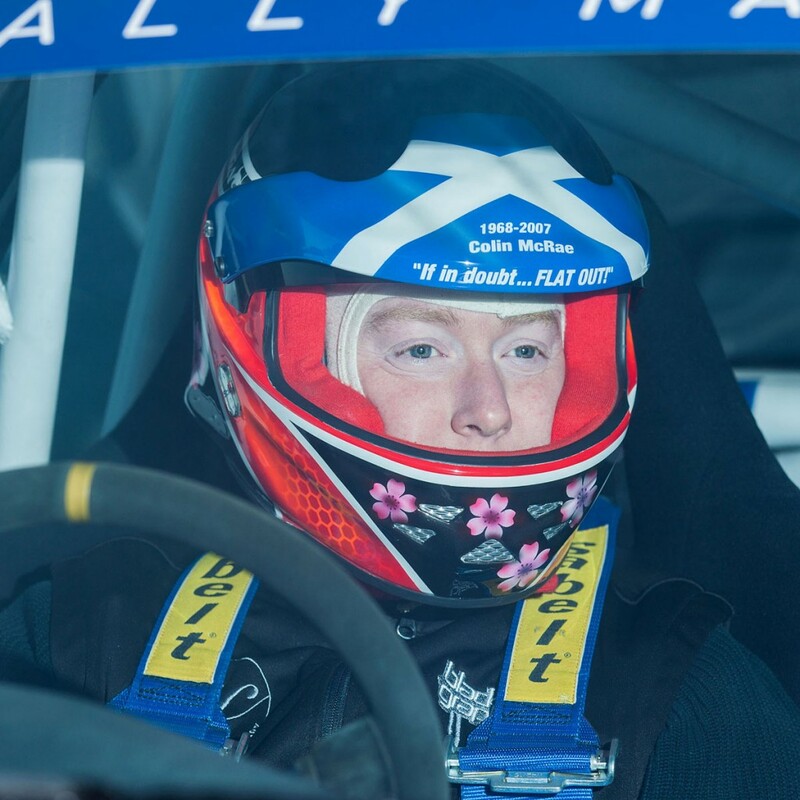 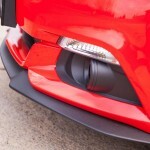 But a sound that means utter business and would even remind you of some yank racing you once watched on the television. 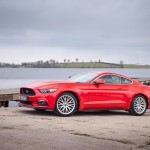 I have no doubt there are much faster cars out there that are better built and will handle a little better, but what they do not have is the character of the Ford Mustang and they also have a price tag that would be at least twice that of this charming Ford. 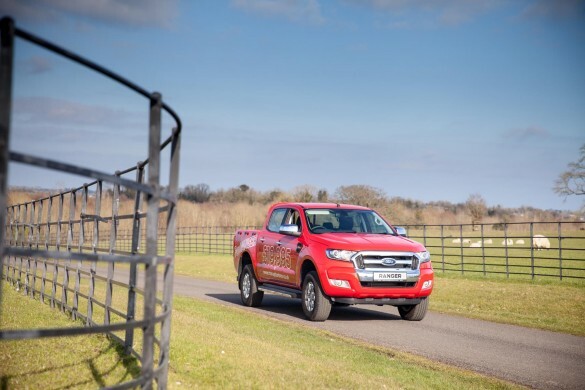 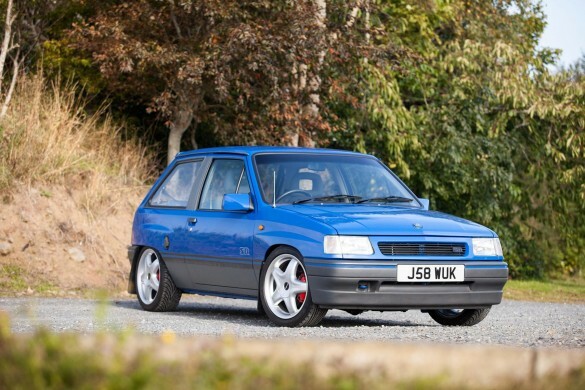 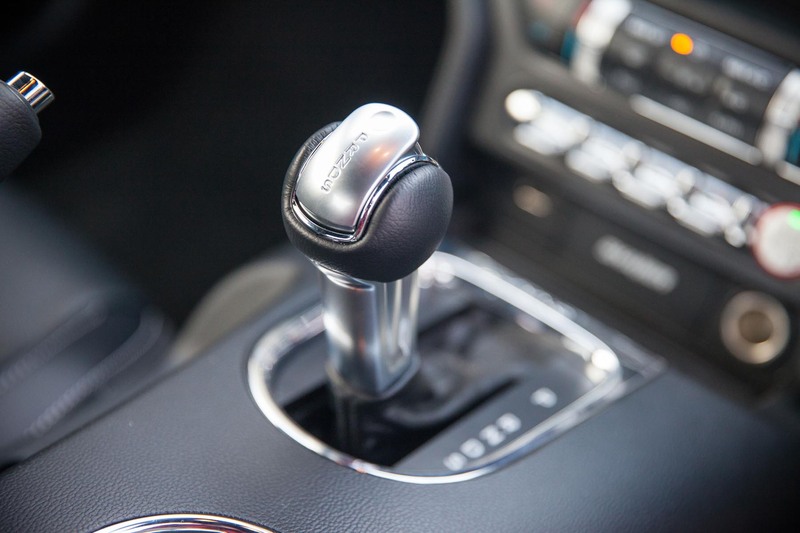 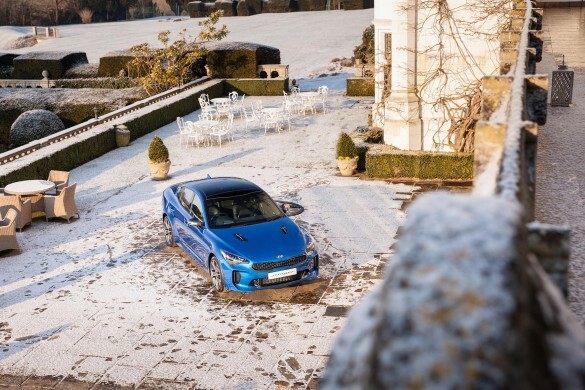 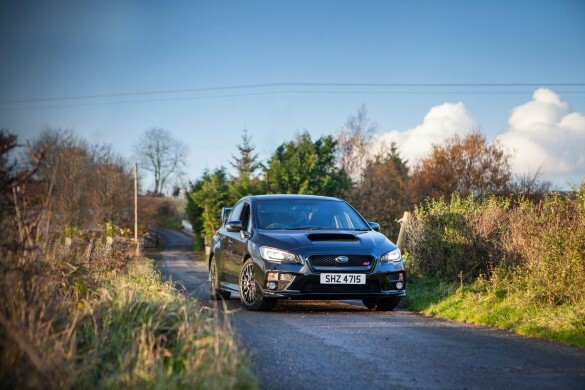 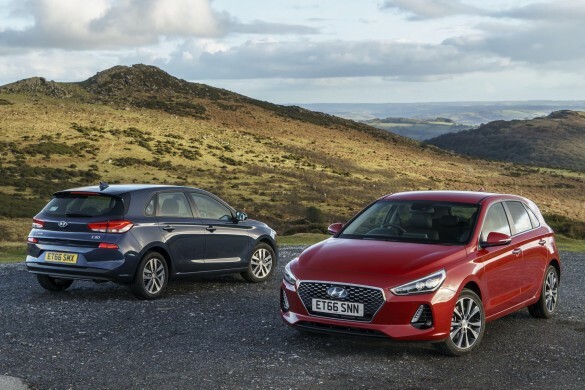 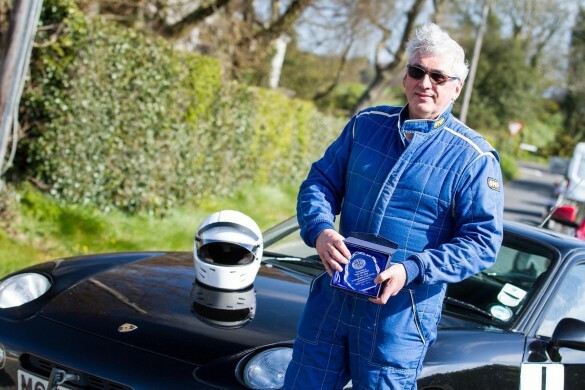 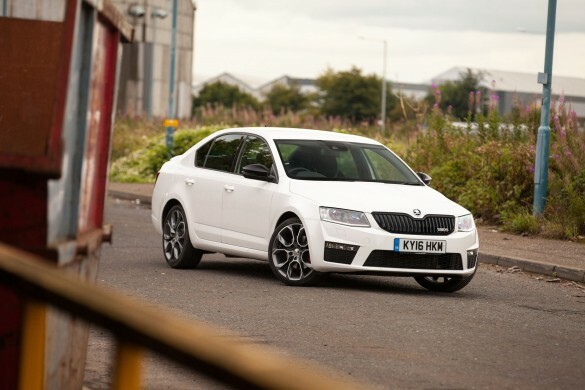 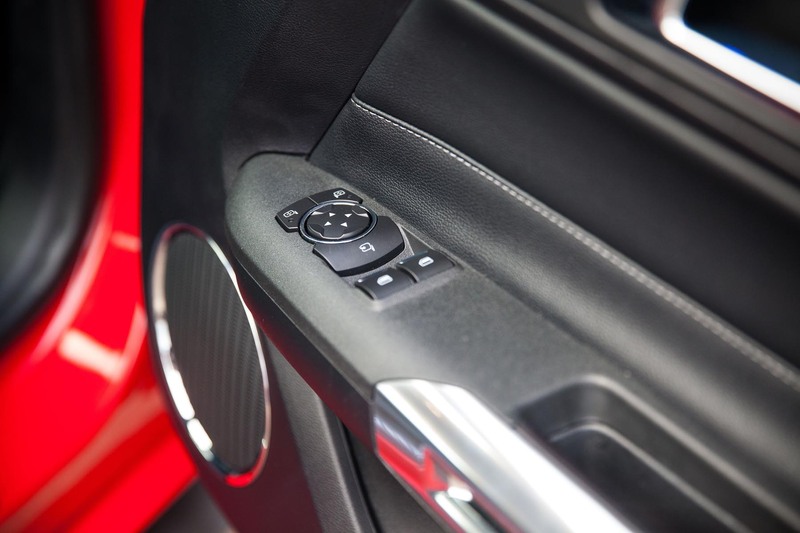 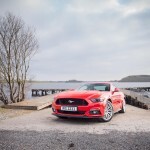 With only two engine choices, Ford have kept the gearbox options simple also with just two ‘boxes on the market, a six speed manual and an automatic six speed that was fitted to this test car. 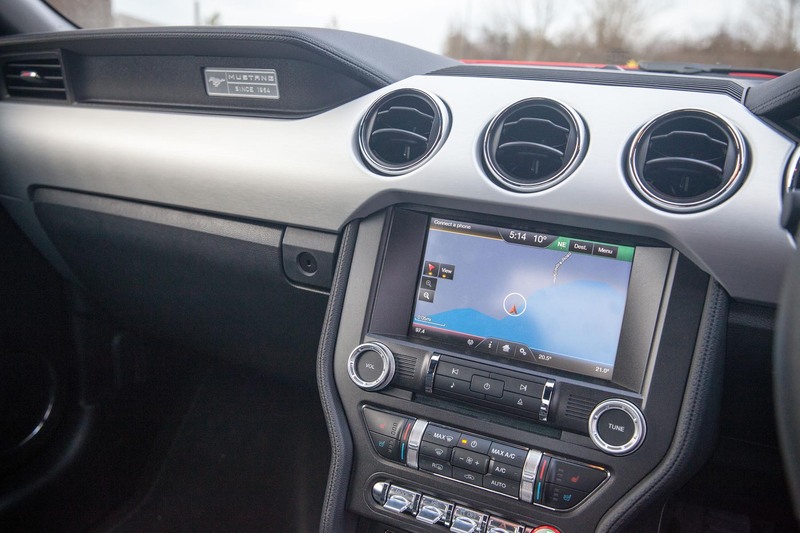 I feel the perfect combination would be the V8 matched to the manual ‘box as the automatic, despite having paddles, doesn’t like to be rushed. 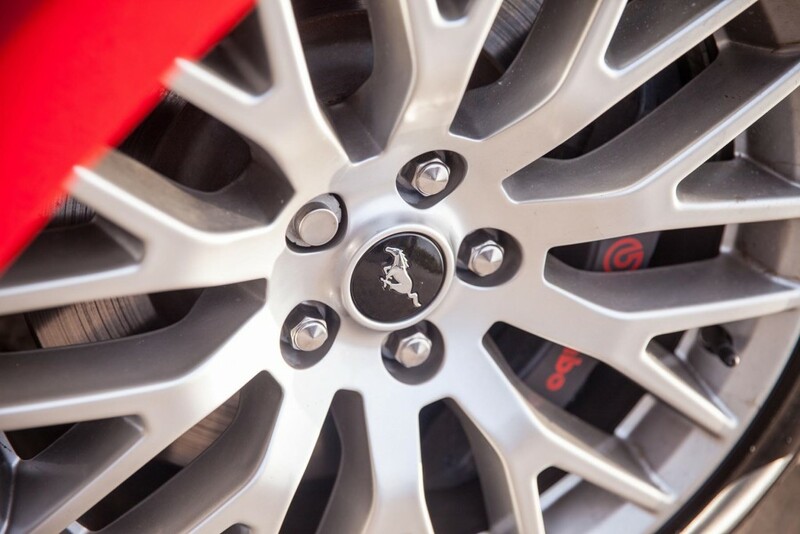 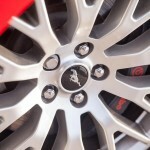 Brembo brakes take control of slowing the Mustang down and with varying driving modes this Ford muscle can suit several types of driving. 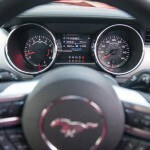 Mode options, selectable from the cockpit are – Normal; Sport; Sport + and one that I wasn’t willing to try, Race mode. 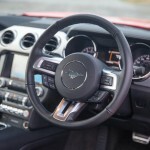 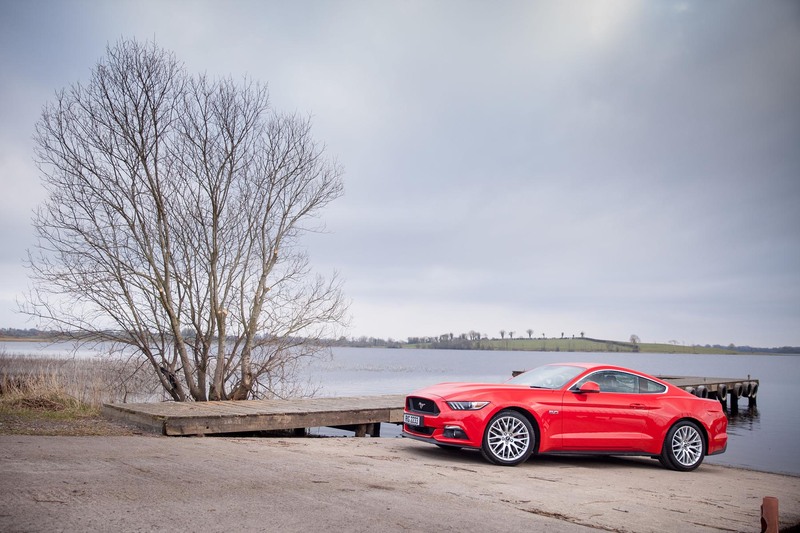 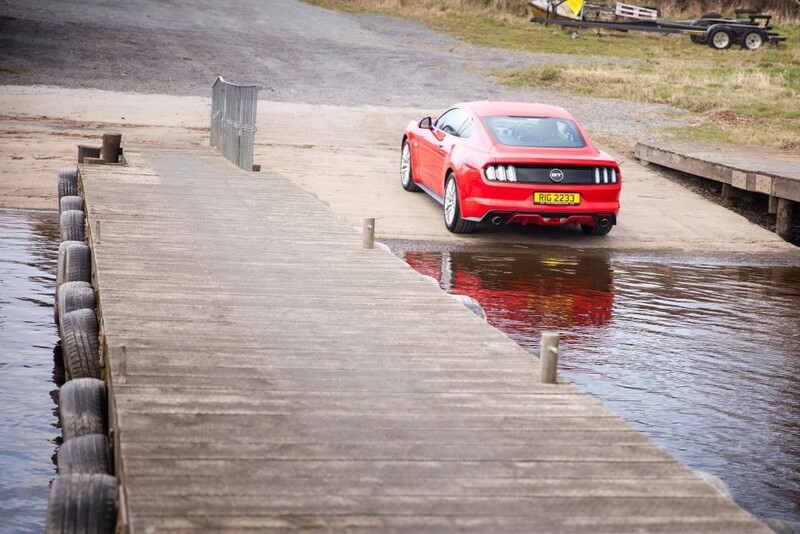 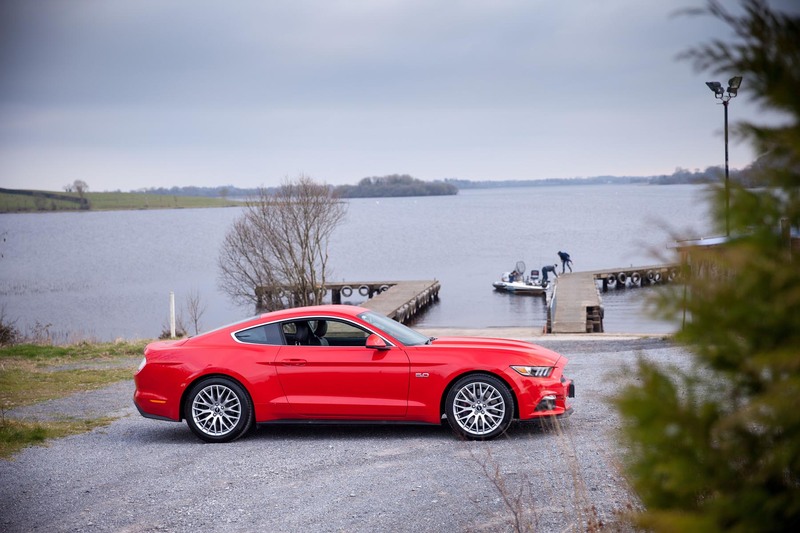 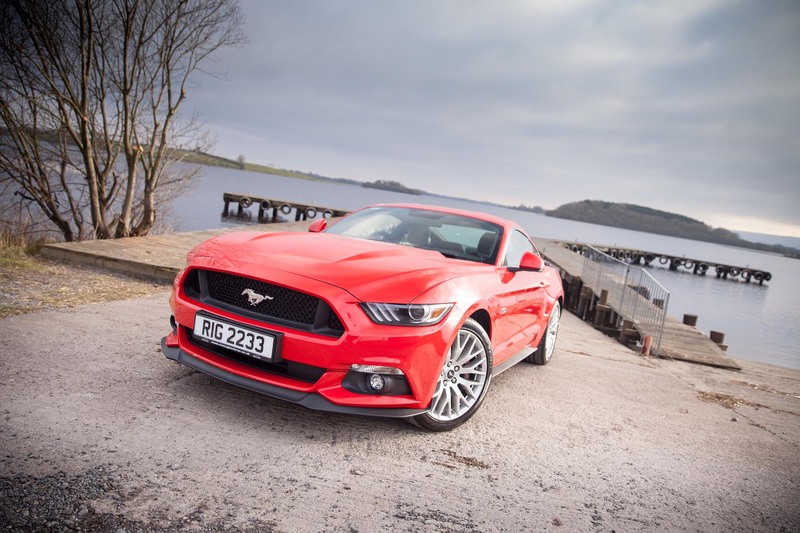 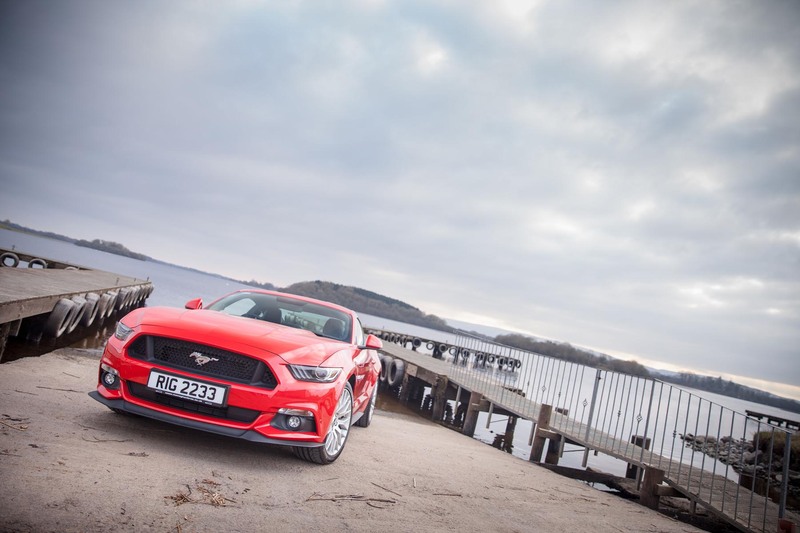 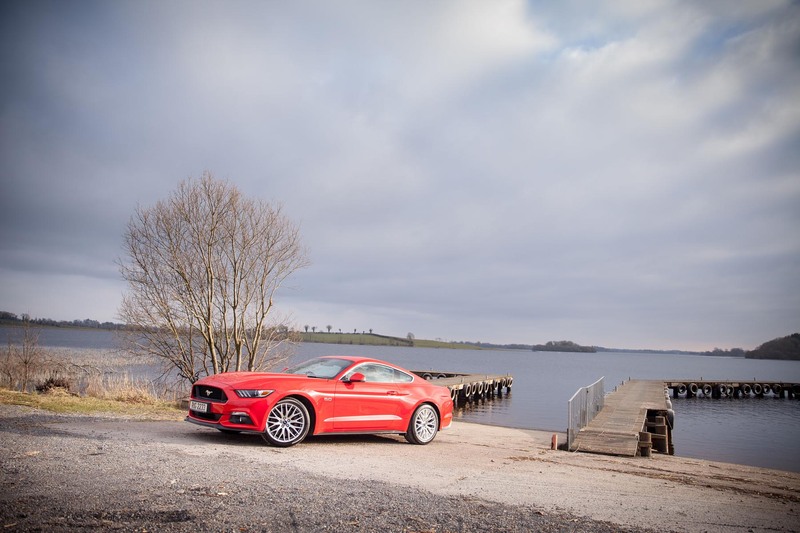 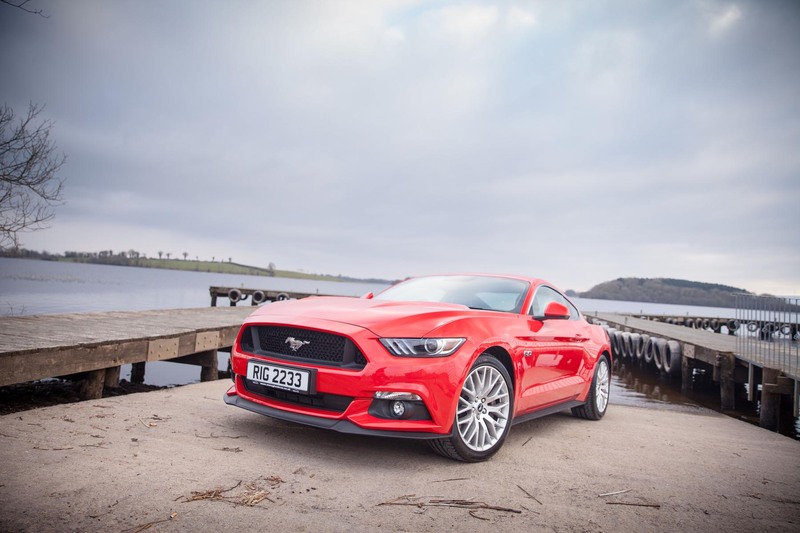 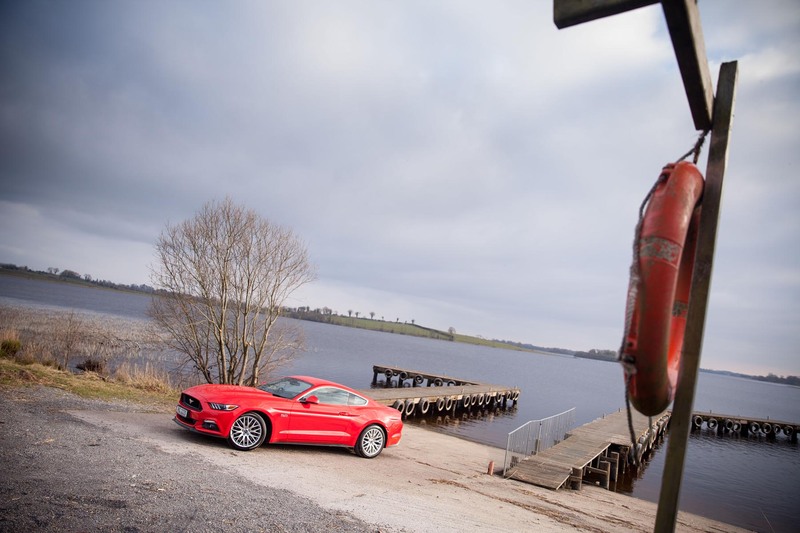 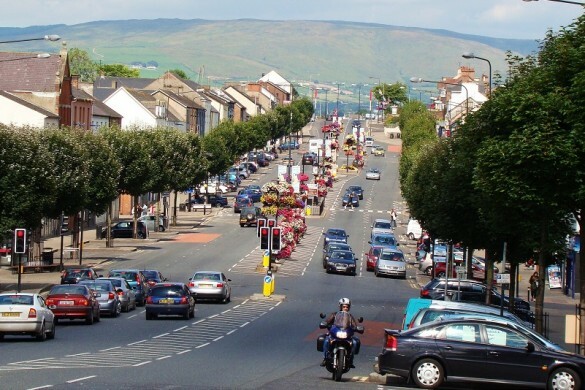 With adjustable steering settings the Mustang is certainly very adjustable to your exact needs and on the dry open roads around the glorious Fermanagh lakes, the Mustang and I became one and really was a car that reminded me of something. 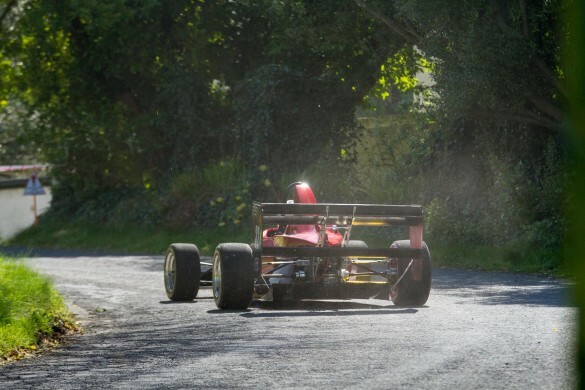 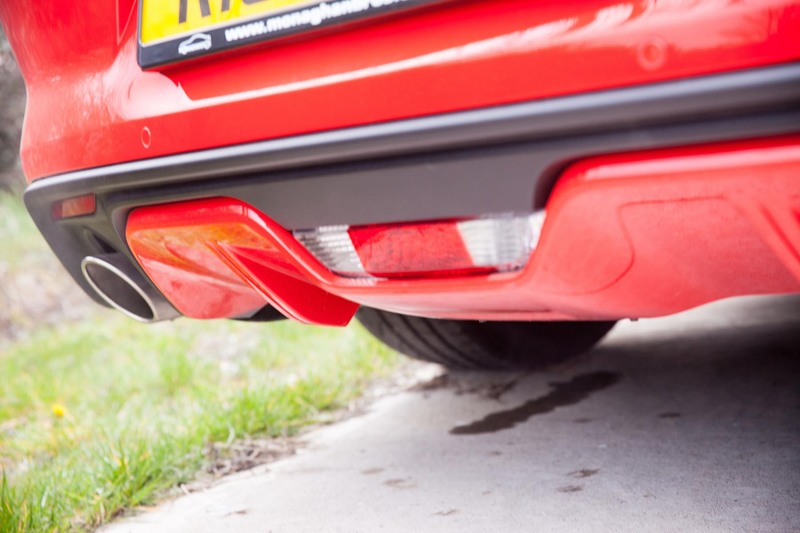 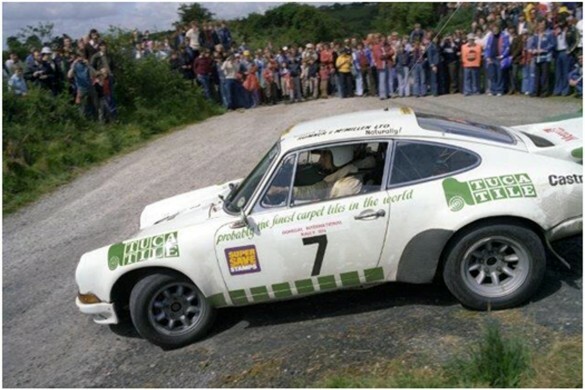 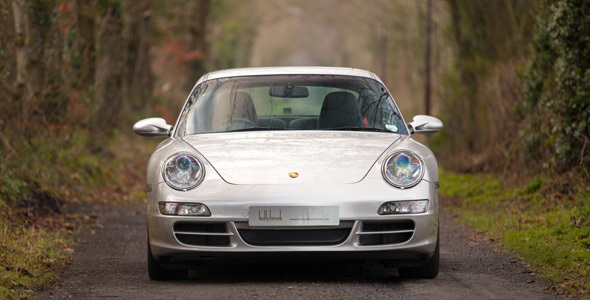 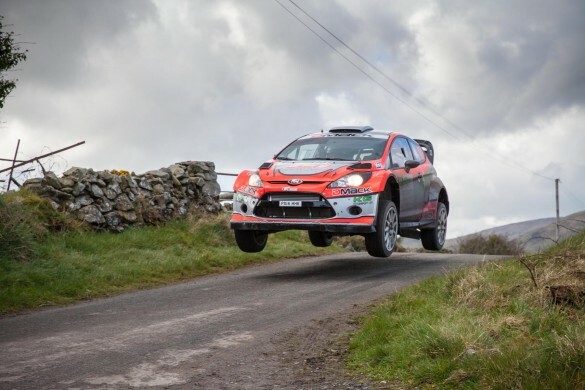 Good enough in fact that over bumps at speeds I will not repeat due to possible incrimination and on undulating Irish tarmac, it absorbed them with ease, if maybe a little light feeling at the rear at times. 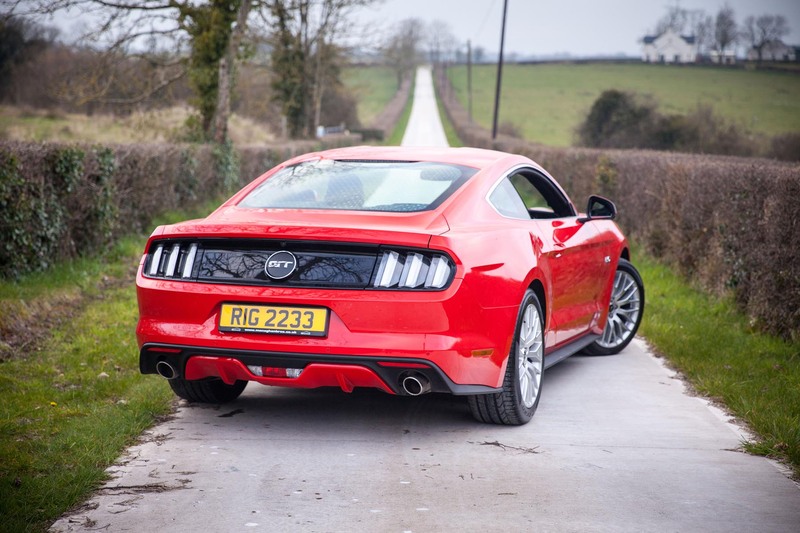 This act of saying “respect me” made me realise just how much character the 2016 Mustang has, I know from driving several of them that few other V8 sports cars would react in such an ignorant, hooligan like way under such average driving mannerisms. 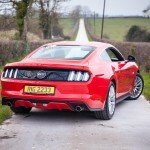 Ford have also catered for the hooligan drivers by adding Line Lock to only the V8 Mustang, which once activated locks the front brakes enabling you to do your bit for global warming by filling the sky with as much tyre smoke as you please before perhaps heading to the start line of a drag strip. 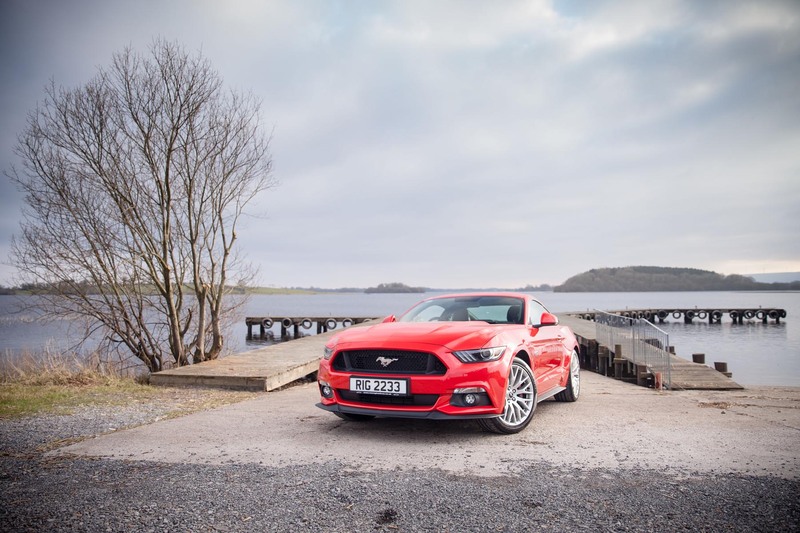 Thank you Ford for unleashing the beast from the stable and sending it across the Atlantic with a V8 that works in perfect harmony with the chassis and throws back to the ancestry of such a steed. 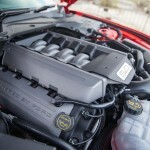 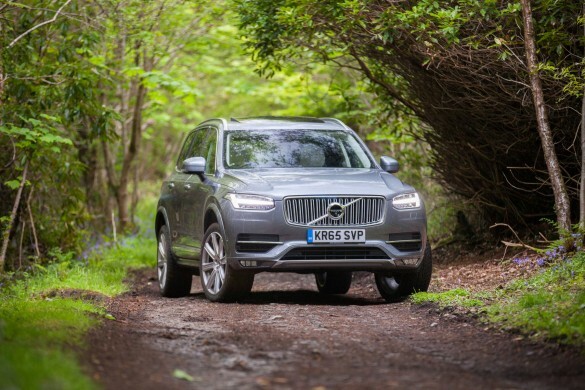 A Beast it really is and at the price of a fully loaded Kia Sorento for example, incredibly affordable. 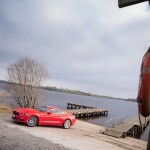 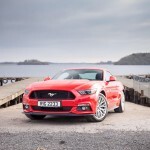 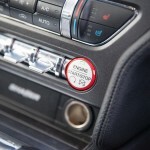 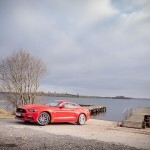 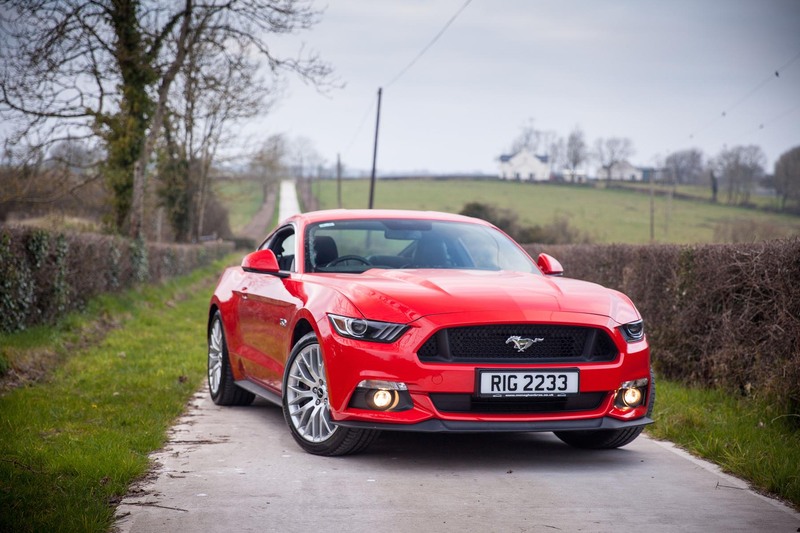 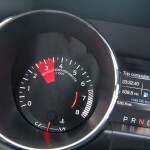 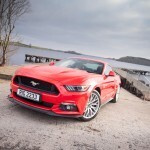 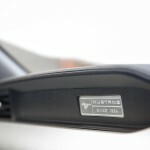 For me personally as a complete car nut who has sought a drive in a V8 Mustang since the first delivery, I would like to thank Marty & John Armitage at Monaghan Brothers as well as Chris B for making this review possible and if I am not mistaken it is possibly the first journalistic road test of the Mustang on Northern Ireland roads.